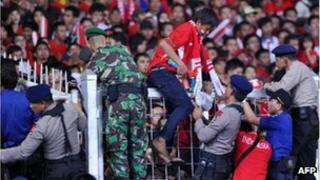 Two football fans have been killed during a stampede at a match between Indonesia and Malaysia. The teams were playing in the final of the South East Asian Games in the Indonesian capital, Jakarta. Many fans had been left angry and frustrated because they could not get a ticket to watch the match, in the 80,000-seater Bung Karno stadium. Reports said a large group of fans rushed the stadium in a bid to get in without tickets, causing the stampede. There had been outbreaks of trouble for days before the match. Groups of supporters set a ticket booth on fire on Sunday and attacked offices at the stadium. Malaysian officials said they had to ask for armoured vehicles to take their team to the stadium because of the atmosphere surrounding the game. "We are saddened by the deaths and it is unfortunate that the game has come to such a point that hooligans and vandals now are spoiling what should be an enjoyable pastime," said Azzuddin Ahmad, secretary general of the Malaysian Football Association. Malaysia won the match after a penalty shoot-out.